Whistler Web Designer, Artist, and Photographer. Rumours have been circulating for years about the coming Apple tablet. The iPad/MacBooklet/iTablet have all been imagined as prototypes in one form or another, usually with Apple authenticity in mind and envisioned as a large iPhone or iPod Touch. I have something different in mind. Let me begin by stating that this is not a prediction. It is not leaked photos or insider information. It is just what one graphic professional would like to see and what I’m willing to pay for it. I want a 13″ MacBook Pro with a full-fledged keyboard, dual-core processor (at least) and for it to have dedicated graphics. I want a solid state hard drive, have it run OS X 10.6 and support oodles of RAM. I want it to not only compete but slay the other notebooks on the market. Now I hear you. You’re saying “But that’s a 13″ MacBook Pro and it’s available today!” And that is where I say… “Yes but I want it to have a detachable screen. And there is no need for shouting :)”. Here’s the deal. I want to be able to detach the screen from the keyboard and have it work independently from the base. When released it acts as a dumb terminal or wireless monitor, utilizing all that power and storage of the base unit. The tablet must have a pen type stylus. To me it’s very important that the tablet experience mimic closely the one I have with my Wacom tablet. Without that I’m afraid it’s destined to become nothing more than an overpriced internet-enabled ebook reader with a smudgy screen. If you think that would be cool, here’s where it gets better. With a flick of a switch, it has the ability to operate independently of the base by kicking into it’s second operating system. The iPhone OS. 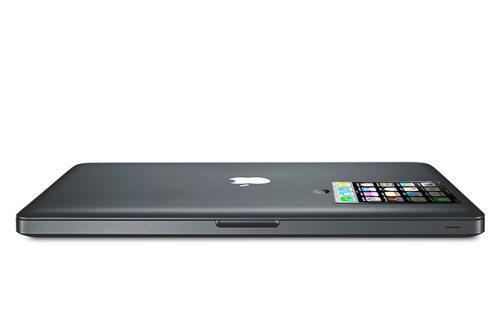 This is where it may more resemble the speculative designs of a big iPhone or iPod Touch. The advantage of including the iPhone OS, and a key feature is that the opposite side of the 13″ panel is sporting a familiar 480px by 320px iPhone screen and interface. Accessible and “always on” when the complete notebook is closed in sleep mode or even turned off. This is my dream product. One that I can only hope for and would expect to retail for around $2300 – $3200 depending on specs. 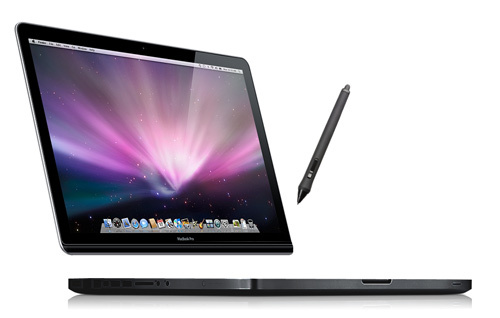 It would be beautifully enhanced with a Cinema Display and could conveniently sync with an iPhone. And one more thing Mr. Jobs and Mr. Ive while I have your attention, I would like this unibody aluminum product to be powder coated black with black cables, dock, and accessories. Is this a lot to ask? UPDATE: Jan. 27 2010 The long-awaited tablet called iPad was announced today and while it’s an impressive looking device, it failed to meet a couple of my key requirements. I can only hope that in future versions it may use a stylus for input and run OS X, capable of running full fledged applications. Today’s product announcement smartly places it in a category that does not replace the iPhone or a laptop which makes it a bit of a luxury item. One that I want but do not need at the moment. This entry was posted on Tuesday, August 25th, 2009 at 10:14 and is filed under Apple . You can follow any responses to this entry through the RSS 2.0 feed. Both comments and pings are currently closed.